As we start 2013, people want to know what the hottest thing in technology will be. We’ve already looked at some of the startups to look out for in Latin America, Southeast Asia, China, and the East Coast of the United States. 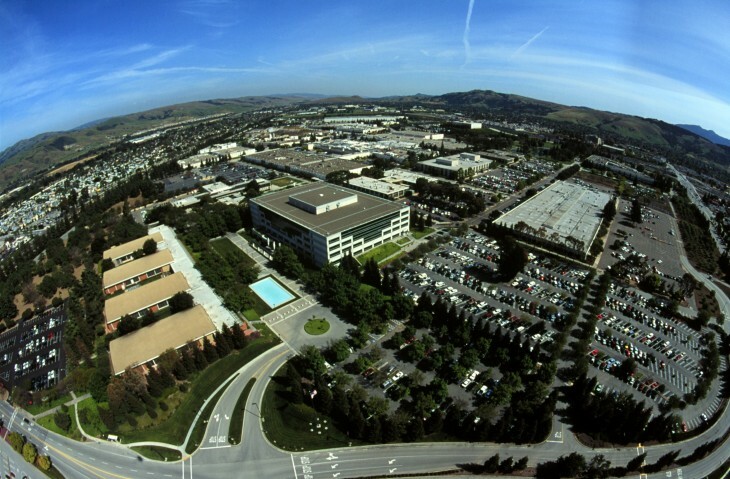 Now let’s look at 10 startups along the West Coast that could be big in 2013. While some might think of Silicon Valley as being the heart of the tech world, the West Coast has several areas with numerous startups and tech companies, including Seattle, Los Angeles, and Portland. These are not presented in any particular order. Started by two members of the #DominateFund, Matt Schlicht and Mazy Kazerooni, Tracks.by is a service geared towards helping artists and musicians release their new music and videos in a way that relates to the social media crowd. As former members of UStream.tv, Schlicht and Kazerooni bring with them their experience helping artists like Lil’ Wayne, the Far East Movement, and others take advantage of social media and engage the community beyond what was normally done through record labels. This Y Combinator alumnus has also launched a spin-off service called Hipset, which claims to make sure you “never miss the hot new songs, videos, and other content” from your favorite artists that you’ve Liked on Facebook. As TechCrunch’s Josh Constine reported, Hipset is the consumer/fan destination while Tracks.by is for musicians and artists. 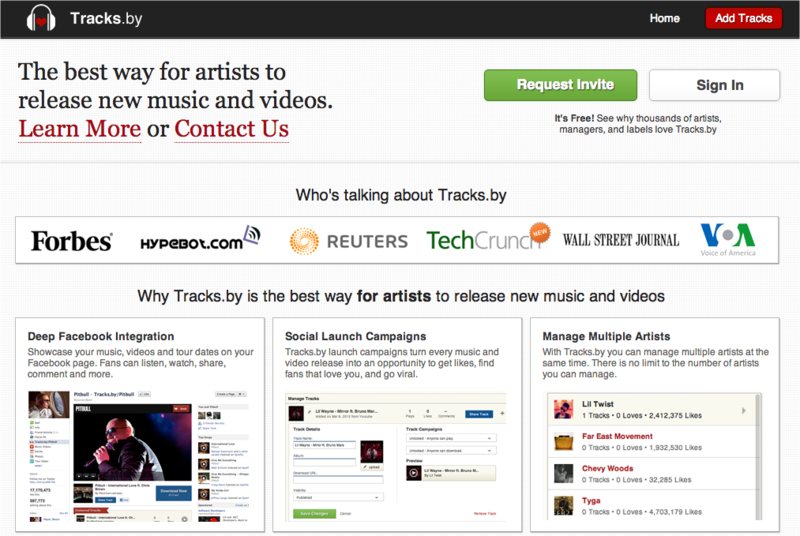 With music services wanting to take advantage of social media, Tracks.by could strike it big in 2013 to help take on other companies like Myspace, Spotify, and others — or it could do the reverse and build relationships with them and integrate their features to give fans a more immersive experience. Started originally as a means to use mobile technology to have things delivered — think Uber for courier service — Postmates launched a new service that seems to have done well in 2012. Popular delivery service Get It Now took off this past summer and the idea is to have anything you want delivered to you within an hour. The limitations of the service include its inability to expand beyond the borders of San Francisco and that the delivery fees could be difficult for some to comprehend using, but there is no discounting how useful a service like this is. Not too long after Get It Now launched, courier service TaskRabbit started its own on-demand delivery service in San Francisco, competing directly with Postmates. However, TaskRabbit’s service only runs between 9am and 10pm on seven days a week, while Get It Now doesn’t have the time limit. In 2013, Get It Now looks to expand beyond San Francisco and says it’s “rapidly expanding into new markets.” Currently the service is only available on iOS devices. The service is currently looking for a team to help launch an Android version of the app. Started by Brit Morin, Brit + Co. is intended to be a lifestyle brand that will teach the digital generation “creative solutions for their online and offline lives.” Many people consider Morin to be “Silicon Valley’s Martha Stewart” and if you follow her on Twitter, you’ll understand where that comparison comes from. The site has already attracted more than 3 million people since its debut in 2011. It has partnered with tech and lifestyle brands like Intel, Fab, L’Oreal, YouTube, UNIQLO, Alloy Media, 3M, Nikon, and others. In September, the company launched its mobile apps, allowing fans and users to follow along while reading daily dispatches of home and lifestyle issues, but with a technology spin to them. Brit + Co. also began moving into e-commerce with its ‘Brit Kits’, monthly deliveries of supplies and materials for customers to have their own “do-it-yourself” kits. It’s a subscription-based model that runs for $19.99 per month. 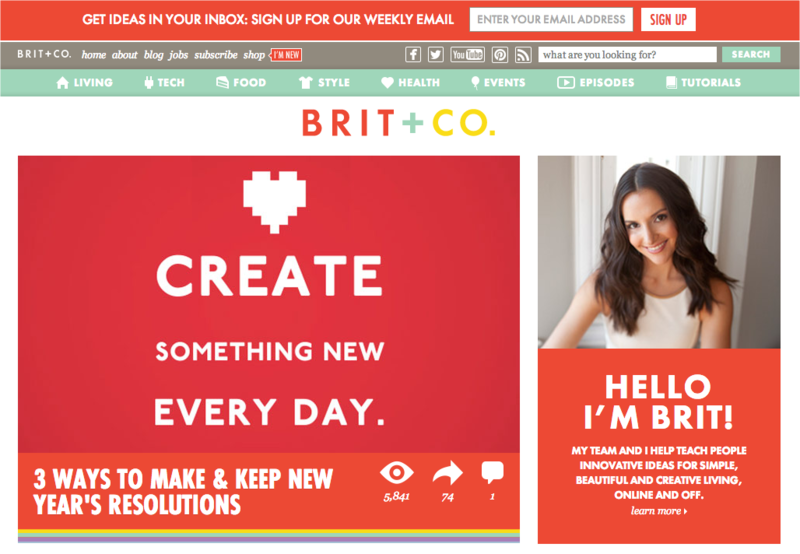 There will most likely be more to come from Brit + Co. in the world of e-commerce in 2013. In addition, Morin is scheduled to be a regular technology correspondent for a nationally syndicated show on ABC. Nest is a thermostat that allows you to control the temperature in the room or throughout the whole hour right through your mobile device. No longer will you need to get up to adjust the temperature — instead you can do it right from something you have on you practically every waking hour. At the Le Web conference last month, Fadell said that Nest is already seeing users around the world and plans to launch in France and the UK as soon as possible. Everyone is always looking for a space to hold their events, whether it’s a birthday, wedding, company party, or for whatever public or private event you can think about. EventUp is a Los Angeles-based company and is backed by the Science incubator. Essentially it operates as the Airbnb for the event space. Event organizers can find venues in cities like Los Angeles, San Francisco, New York City, and Chicago. Founder Tony Adam had said that when the company launched, it expected inbound interest from consumers and has seen revenue growth for things like anniversary and birthday parties, but it is also seeing an increase in bookings on the corporate side. He believes that EventUp is becoming a “go-to source for events” with the service’s selection of highly sought-after locations and comprehensive directory of vendors. One of the things that we’ve learned over the past year or so is the fact that people love to share photos and media across various social networks. Whether it’s Instagram, Facebook, Twitter, Flickr, or other services, businesses are interested in aggregating it in some way to prove how good their campaign has become. Chute is a service that aims to consolidate all the media into a special format that can be displayed as a slideshow or be used on blogs or other sites. The service is being used by companies like TaylorMade, NBC News, TNT, Yammer, MetroPCS, Klout, Gilt City, the New Jersey Devils, and others. Chute is also a member of the first class of Turner’s Media Camp, an accelerator that focuses on educating startups on building and growing media businesses. It recently partnered with Echo to create an app that leverages real-time, user-generated photo walls for brands. As more people are flocking to services like Instagram, Flickr, Facebook, and Twitter to share media and content, there will always need to be a way to consolidate the data so that it can easily be consumed. This San Francisco-popular service looks to expand to other parts of the United States in the near future. 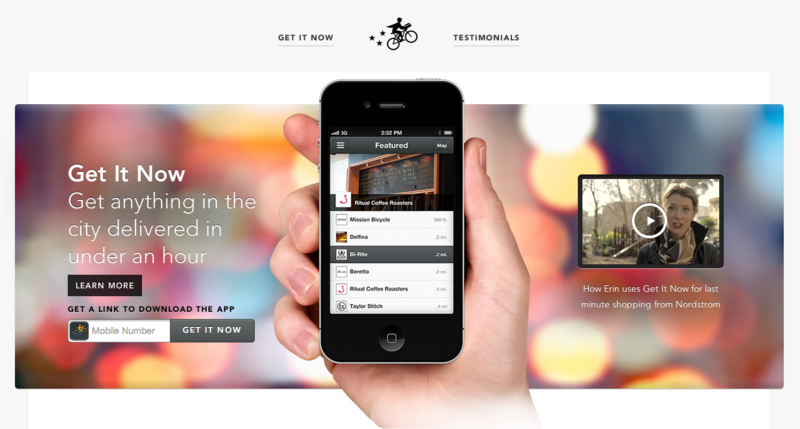 Many in the city swear by it, including TNW’s Alex Wilhelm. The premise behind Lyft is that it’s a ride-sharing service, but instead of summoning a black car service like Uber or a taxi cab, ordinary drivers will pick up passengers using their own vehicles. Lyft is usually cheaper than an Uber and its drivers undergo a pretty extensive background check before being added to the service. Last month, the company said that it was seeking to help bring the “social transportation” revolution to others. Cities such as Seattle and Los Angeles have been mentioned as specific cities for the service’s possible expansion. 2013 could shape up to be a deciding year for ride sharing services. Last year, some cities had trouble with these services and took it out on Uber and Lyft. In San Francisco, the transportation regulators have issued cease and desist orders and even fined Lyft over its operations. Should this issue be resolved, the next twelve months could be rather interesting to see how the company moves forward. Based in both San Francisco and in New Brunswick, Canada, Clarity comes into this list because of its desire to help connect entrepreneurs and businesspeople with those that can help answer their dilemmas. Started by serial entrepreneur Dan Martell, Clarity wants to help move dreams forward and it has done so with the use of mobile technology and a network of mentors. The company says that its goal is to help impact one billion people worldwide in a positive way over the next 10 years. If anything, this is why Clarity is on this list — it will be fascinating to see how much closer it will get towards achieving its own goal. So far, the service has processed over 12,000 calls from across 47 countries since its launch in May 2012. Travel is definitely a major industry anywhere in the world. Peek aims to help you “book amazing things to do” because most of the time, people are concerned with getting to their destination and where they’re staying. But when they get there, they’re confounded because they don’t know what to do. Peek helps to sort things out. Currently it’s only available for Hawaii and the San Francisco Bay Area, but looks to expand its service to other areas soon. In November, the company released its Perfect Day Builder that allows anyone to generate their own itinerary. The goal is to share tips and ideas of your favorite places if you had one perfect day to enjoy it. It could be anywhere in the world. Will 2013 be the year where Peek begins to accelerate the growth of its activity database and expand to new cities? We’ll have to wait and see. The introduction of smartphones in our lives has certainly helped to make it busier. It’s always a drain in productivity when we’re spending hours simply trying to keep up with everything going on. 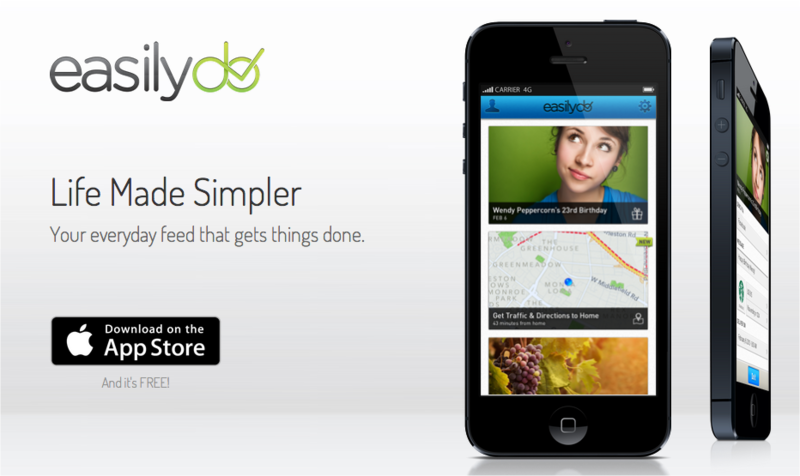 Easilydo is a service that wants to take control of the multiple things we need to do and organize them in a way that makes our lives a bit easier. The service says it helps users never miss any of life’s important moments like birthdays, events, social updates; make sure you navigate your busy day easily by providing you ‘time to leave’ alerts, notifications to others, etc. ; and help keep you organized on the go by making sure all address book contacts are filed away. As more services come to mobile devices, it will be fascinating to see what Easilydo does next to help streamline our lives. Correction: We previously had listed TaskRabbit’s Deliver Now hours of operations incorrectly. It has been changed to now reflect the new hours.